Planit is dedicated to taking the leg work out of trip planning– so you can spend more time seeing the world and less time staring a a planner and sifting through emails. This is an overview of Planit's preliminary concept development, research, wire framing, prototyping and user testing. I created this site as my capstone project for the two month long Springboard UX Design Workshop. The process of planning a trip, especially with several people, is my least favorite thing to do. But, before I got too deep into development, I needed to make sure others felt the same way. 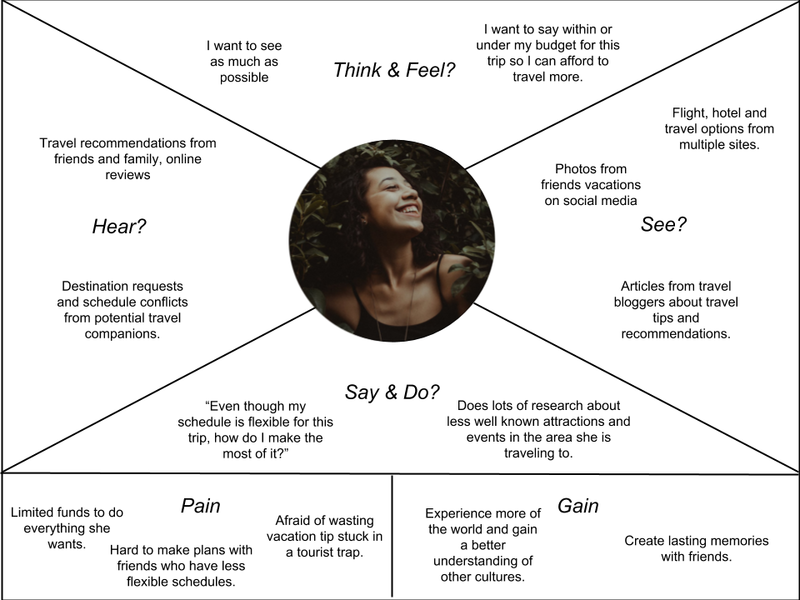 I conducted an online survey with 27 participants to see what their biggest pain points were when planning a trip. The survey and follow up interviews confirmed my overall suspicion that a) planning a trip is hard and b) most people want an easier way to do it. It also gave me some insights I didn't expect. Like most people have never used a travel agent and the one person who had said she would not do it again. The interviews also helped guide the sites and apps used for my competitive analysis. I couldn't find one app or website that encompassed all I wanted to accomplish with Planit. So, in my competitive analysis I looked at several sites users frequently used when planning a trip: Tripadvisor, Airbnb and Tripit. I focus on each sites process of planning a trip, how information on the site is presented and the intuitiveness of each site’s features. The evaluation focuses primarily on three NNG usability heuristics: Match Between System and the Real World, Recognition Rather than Recall and User Control and Freedom. Based on my interviews, I identified three user personality types: the Planner, the Tagalong, and the Explorer. Each user has different wants and goals for their trips but still face problems in the planning stage. This stage helped me gain empathy for the actual humans who will be using this site as well as identifying unique potential issues each user type might encounter. My user personas helped me identify the types of actions users would want to take on my site. Using this information, I created User stories which later helped me define my Minimum Viable Product. To begin laying out Planit's IA, I identified what features should be present in my MVP then conducted a card sort exercise with three separate participants who fit my user personas. I used the outcome of these excercises to build an intuitive sitemap. Using my personas and their needs, I created user flows for each personas and tasks they would need to complete. These actions include: Creating an account, creating a trip and adding a reservation to an itinerary. I created several variations of each page using paper and pen before moving on to more polished digital wireframes. This process of creating several versions of each paged helped define page hirearchy and different way to use the visual real estate available to me. While the Planit design is far from its final state, it was important to establish some preliminary standards for fonts, colors and button shapes to give users quick visual queues about how to use the site. Using the digital wireframes I created, I built a prototype using Adobe XD. I used this prototype to conduct usability testing with several users. For the first round of user testing, I introduced five potential users to the Planit prototype. Overall, all of the users were interested in a product like Planit and were able to navigate the prototype easily. I was able to gain useful insight as to how users would want to use the site and received feedback about existing and potential features. Click Here to test the prototype for yourself.